Ellis Island Immigration Museum, part of Statue of Liberty National Monument, will reopen to the public on Monday, October 28 for the first time since Hurricane Sandy submerged the island a year ago. Visitors will once again walk the halls of the immigration station where 12 million people began life in America. Open areas on the first and second floors include the Great Hall, where immigrants were inspected, and Journeys: The Peopling of America 1550-1890. This first-floor exhibit, developed with the support of The Statue of Liberty-Ellis Island Foundation, tells the story of American immigration prior to Ellis Island’s years of operation. Visitors can pick up a free audio tour, join a ranger program and watch an introductory film. 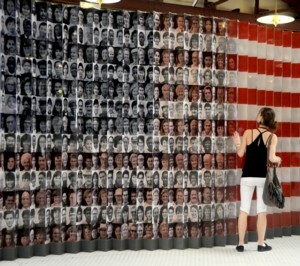 Outside, visitors can stroll to the popular American Immigrant Wall of Honor and take in fabulous views of Manhattan. Ellis Island Immigration Museum will remain a work in progress at least through the spring. Repairs to the water and sewage systems have already taken place. An entirely new electrical system will be installed along with a new air conditioning system for climate control of the park’s million documents and artifacts. Elevator access to the Great Hall on the second floor is not yet available, but should be restored by early next year. Because of the storm, most of the museum collection is currently stored in a climate-controlled facility in Maryland. A temporary ventilation system will be replaced by permanent equipment later this year. When Hurricane Sandy hit New York Harbor on October 29, 2012, Ellis Island was completely covered by water. The storm surge destroyed electrical, communications, heating and cooling systems. After the Statue reopened on July 4, the park shifted its efforts from repairs at Liberty Island to planning the more complex task of reopening an historic structure that preserves a delicate museum collection. Ellis Island was the former federal immigration processing station which processed over 12 million immigrants between 1892 and 1954. A 1965 presidential proclamation added the island to the National Park Service as part of Statue of Liberty National Monument. After years of neglect, major restoration work on the Main Building took place in the 1980s, opening as the Ellis Island Immigration Museum in 1990. The National Park Service works with its partner organizations, The Statue of Liberty – Ellis Island Foundation and Save Ellis Island, to improve and enhance operations at the park. To visit Ellis Island and the Statue of Liberty, purchase tickets at www.statuecruises.com. Statue Cruises is the business that owns and runs the ferries that take visitors to the park. The website contains information about ferry ticket prices. (877-LADY-TIX or (201) 604-2800, www.statuecruises.com). For more info on visiting the Statue, see http://www.nps.gov/stli/planyourvisit/index.htm.